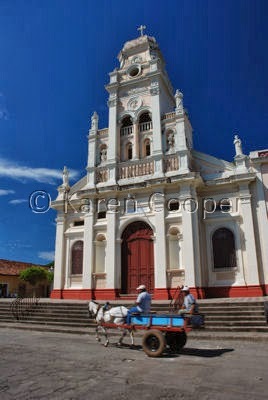 Xalteva Cathedral in Granada, Nicaragua, is another pretty impressive sized cathedral. Xalteva actually gets its name from the indigenous settlement that was there long before the Spanish moved in. I can find very little information on these ancient peoples and their culture. But it is supposed to be the oldest part of the city of Granada, and I can believe that. The area that surrounds Xalteva seems to evoke an air of old worldy charm. She has been constructed and reconstructed over the last couple hundred years. Looks pretty spiffy now. The Xalteva Park across the street seems shrouded in sadly worn history. There is also rumor of an underground tunnel here. Xalteva is a few minutes above ground walk to The Cathedral towards Lake Nicaragua. In a straight line. I know it's intriguing!